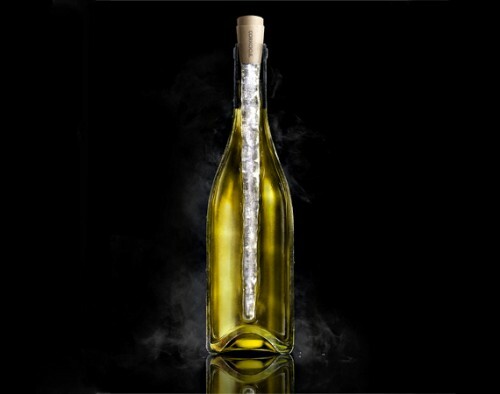 The Corkicle Is A Potentially Stupid Wine Chiller | OhGizmo! We want to like the Corkicle, really we do… it’s just that we’re not sure whether it actually would work properly. The idea is that you put the thing in the freezer and once you get some wine you need to chill, you insert it in the bottle and let it do its thing. Presumably it’s plastic filled with some type of material that has a high specific heat. And it looks kind of nice in the pictures, so this could be a good addition to your dinner table; the wine chilling while looking nifty. The problem of course is that the Corkicle has volume. And it will displace some wine. How much is the issue… but really, almost any volume will cause the wine to spill over. Perhaps you’re meant to empty the bottle a little before inserting the Corkicle? We don’t really know and aren’t willing to spend $23 to find out. To clarify some of your concerns, the Corkcicles function is primarily to maintain the temperature of chilled white wines, not actually chill down a bottle. Since the bottle starts chilled, the first pour is ready to go without the need of the corkcicle. In actual tests, the Corkcicle took a 50 degree bottle of chardonnay in a 72 degree room and after 40 minutes the temperature was 51.9 degrees, as opposed to 60.4 degrees if left on the table. This is still very much in ideal temp range. Cheers….definitely don’t put your eye out, but give er’ a try!